This rustic looking straw hat is something any country lover will adore. It is great looking, while still being practical. It has a cowboy hat design, with a simple narrow band across the bottom of the hat. The hat features a pinched top. The broad, sun-protective brim features frayed edges for an unusual appearance. The beautiful criss-cross weaved design is attractive and also allows for great air circulation to help keep things cool when they get warm. This is a great unisex design that comes in a natural straw colour. It is available in one size and has an elasticized sweatband to accommodate head sizes up to Large. With a comfortable, sun-safe design and a rustic frayed-brim, the only thing these hats still need is your logo on the hatband. 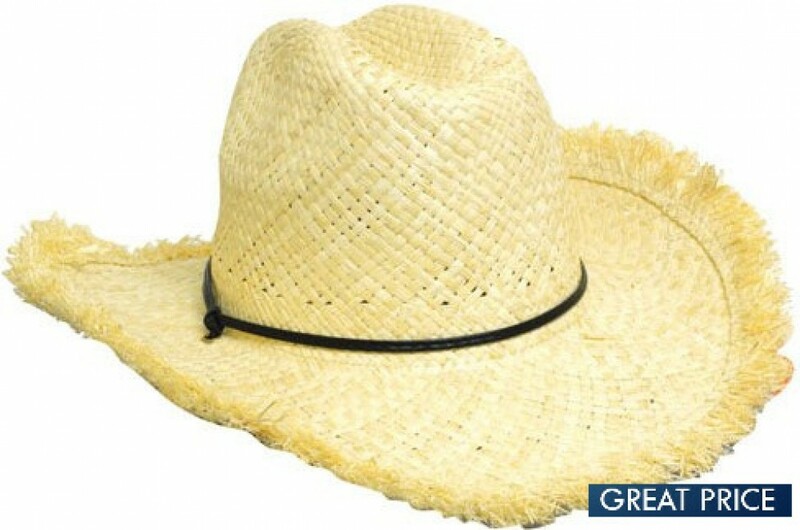 These attractive hats are great for uniforms or promotional sales in the country tourism industry. Great for farm-stay businesses, petting zoos, animal parks, horse ride centres and anywhere an old-fashioned rustic style is an advantage.